Sperling Mennonite Brethren Church, 1951. 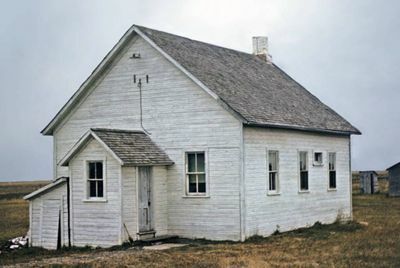 The Sperling Mennonite Brethren Church in Sperling, Manitoba began services in 1928, and formally organized in 1932 with 20 members. The congregation originated through immigration from the Soviet Union. Originally the Mennonite Brethren immigrants worshipped together with the General Conference Mennonites, but they began meeting separately in May 1928. The group joined Winkler Mennonite Brethren temporarily in 1954, but became independent again soon after. The congregation dissolved in the 1970s. In 1965 there were 11 members. Neufeld, Herman and Marlene Epp. "Sperling Mennonite Brethren Church (Sperling, Manitoba, Canada)." Global Anabaptist Mennonite Encyclopedia Online. September 1986. Web. 24 Apr 2019. http://gameo.org/index.php?title=Sperling_Mennonite_Brethren_Church_(Sperling,_Manitoba,_Canada)&oldid=116218. Neufeld, Herman and Marlene Epp. (September 1986). Sperling Mennonite Brethren Church (Sperling, Manitoba, Canada). Global Anabaptist Mennonite Encyclopedia Online. Retrieved 24 April 2019, from http://gameo.org/index.php?title=Sperling_Mennonite_Brethren_Church_(Sperling,_Manitoba,_Canada)&oldid=116218. This page was last modified on 19 March 2014, at 04:19.